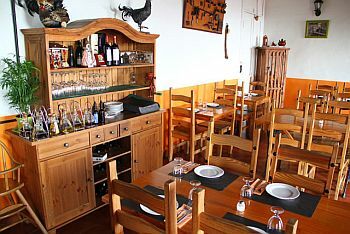 La Casona del Vino is a charming, traditional Canarian restaurant found away from the tourist track in the north-east town of Candelaria. 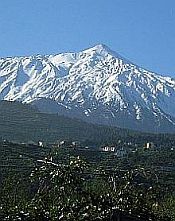 Its name translates as "The House of Wine", but it's not quite that simple. "Casa" is the usual Spanish word for "house". "Casona" means more a large house, or mansion. As you can see, the interior is pleasant, with clean lines and is very Canarian. 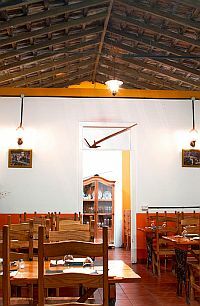 It is the boast of the restaurant that, being away from the main tourist areas, it can keep its prices very competitive. Amongst the soups available is "escaldon". This is made from gofio, meat stock, onions and red mojo. I said the restaurant was traditionally Canarian and you can't get more traditional than gofio! There's also something amongst the starters which is bacon with dates! Could this be a little bit of North African influence? Also a starter, we have grilled cheese with no less than three mojo sauces. I thought there were only two, but it seems that the third is one made from palm honey and originates on the neighbouring island of La Palma. As for the main courses, there's a comprehensive selection of fish, chicken and meat dishes, including "kisses of tenderloin", consisting of pieces of steak sauteed then wrapped in bacon and presented in a fruit sauce. The restaurant's website has many images of menu items and they all look really appetising. Also there is a link to a page of reviews on TripAdvisor. It's no wonder, because they are all glowing. Even though they're mostly written in Spanish, you can probably get the gist from their headings: "Recomendable", "un restaurante increible", "sensacional", "excelente" and so on. You can't be doing too badly if the locals are impressed! All in all, this restaurant looks like a really nice place to eat and might well be worth a drive up from the south to sample it.